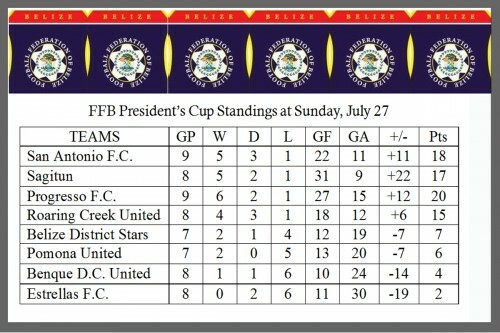 The FFB President’s Cup tournament continued with 3 games played yesterday. Down south at the Carl Ramos Stadium in Dangriga, visiting Sagitun FC clipped the home team Pomona United, 2-1, with goals from Darren Thompson (2’) and Rollin Burgess (65’); while Jevon Aranda (60’) got the sole tally for Pomona. Out west at the Isidoro Beaton Stadium, the home team was successful, as Roaring Creek United dropped Estrellas FC of Toledo by a 4-2 margin. Shaking the net for Roaring Creek, with 2 goals coming from the penalty spot, were Kenny Williams (11’), Alden Coleman (35’ PK), Alexander Watson (40’) and Orin Reneau (83’ PK); while Estrellas’ goals were by Ernest Lambey (6’) and Christopher Burke (42’). With the MCC closed since June 2 for renovations, the Belize District Stars played their home game at the Ladyville Football Field, and the visiting Progresso FC came away with the 2-1 win, courtesy of goals from Eliazar Itza (20’) and Alexander Diaz (75’). Delroy Andrews (12’) scored in the losing effort for Belize District Stars.